Moulds for the production of prestressed concrete sleepers. With more than 20 years of experience in producing prestressed monobloc sleepers, Betonfabriek De Bonte has gained a considerable expertise in this field. Based on this, they developed their own optimized production machines and moulds which are sold internationally. In the past few years, De Bonte have exported over 3000 moulds of very different types. Prototypes and test moulds are produced in the company’s own mould building department in Belgium. After testing, the serial production of moulds is carried out at De Bonte’s production facilities in Asia, under supervision of the Belgian management. The moulds are produced with a reaction frame which is able to absorb the pretension strength. 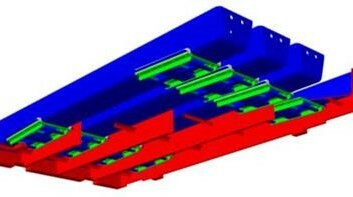 This frame is designed to prevent cracks and other types of deformation of both the mould and the sleeper. The moulds are designed to be used with interchangeable rail seats of Pandrol, Vossloh and Railtech systems. This allows the customer to produce the same sleeper with different types of fixation systems.